NASA's twin Stereo spacecraft celebrate their fifth birthday today (Oct. 25), marking five years of studying the sun and its powerful storms from their unique tandem perspective. The two Stereo probes — whose name is short for Solar TErrestrial RElations Observatory — blasted into space together on Oct. 25, 2006, on a mission to view our star as it has never been seen before. And the spacecraft have not disappointed; their current vantage point on opposite sides of the sun from one another allows scientists to see the sun's entire surface simultaneously. 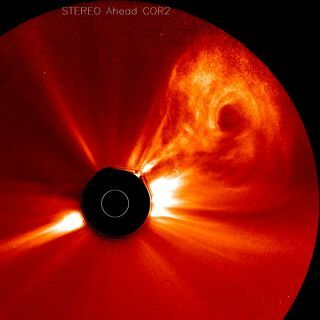 "Over the last five years, each Stereo spacecraft has moved to a position in its orbit where it can capture side-view images of anything the sun sends our way, " Joe Gurman, Stereo project scientist at NASA's Goddard Space Flight Center in Greenbelt, Md., said in a statement. "That's helped us come up with many new answers to old questions about solar activity." That activity often manifests in bursts of radiation called solar flares, as well as massive eruptions of solar plasma known as coronal mass ejections (CMEs), which can streak through space at 3 million miles per hour (5 million kilometers per hour) or more. Stereo observations helped scientists track a CME in full for the first time ever, from its origin on the sun to its collision with Earth 93 million miles (150 million km) later. The probes' data have also revealed that solar energetic particles, which can damage satellites and astronauts' DNA, are flung through space much more widely than previously thought, researchers said. The twin spacecraft have also kept an eye on some other cosmic phenomena. They watch comets that tread close to the sun, for example, even recording the tail of Comet Encke as it got torn off by a solar eruption in April 2007. The two spacecraft, known as Stereo-A and Stereo-B, won't be on opposite sides of the sun forever. Stereo-A flies in an orbit that's smaller and therefore faster than that of Earth, while Stereo-B has a bigger, slower orbit that causes it to lag behind. By 2015, the twin probes will line up on the far side of the sun. Then they'll continue going their own way, getting farther apart until both are on Earth's side once again. "Stereo was designed to understand what causes CMEs and how they travel, as well as to understand the structure of the solar wind. It's already made great strides in doing that," Gurman said, referring to the probes' mission. "I'm looking forward to the next five years."